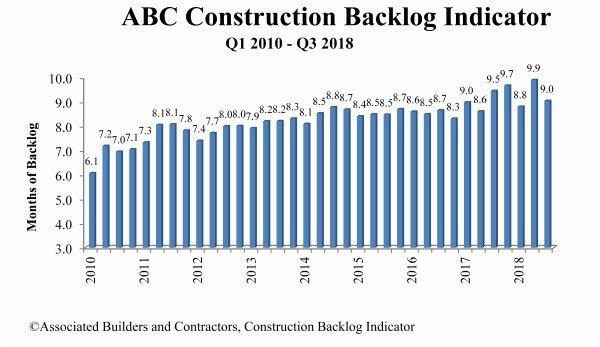 Washington, D.C. — Associated Builders and Contractors (ABC) reports that its Construction Backlog Indicator contracted to 9.04 months during the third quarter of 2018, down 8.4 percent from the second quarter and 4.3 percent lower than the same time last year. Backlog declined in the West, partially attributable to the wildfire that ravaged California. Despite this, regional backlog remains 2.7 months higher than at the same time one year ago. Construction activity is poised to remain elevated in Seattle; Portland, Oregon; San Jose, California; Los Angeles; Denver; Salt Lake City; Boise, Idaho; and Phoenix — suggesting that construction industry-related human capital shortfalls will continue to worsen. Backlog in the commercial/institutional segment declined during the third quarter and now stands at its lowest level since the fourth quarter of 2016. Many factors are likely responsible, including higher capital costs for developers. Backlog decreased in the heavy industrial category but remains within one-tenth of a month of the all-time high established during the second quarter of 2018. Industrial production continues to expand in America, but uncertainty regarding future trade policy may be hampering investment in manufacturing and other industrial categories. Large firms — those with annual revenues in excess of $100 million — saw their backlog contract by about one half of a month. Many of these firms are exposed to infrastructure, a category associated with diminished backlog during the third quarter of 2018. Average backlog among firms with annual revenues between $50 million and $100 million fell to 10.3 months, a decrease of more than 30 days. Still, backlog in this firm size category generally remains elevated.